Note: This is a post by Brian Skinner as part of a blog exchange. He has his own blog, which I heartily recommend, called Gravity and Levity. He is currently a postdoctoral scholar at MIT in theoretical condensed matter physics. The central, and most surprising, idea in the conventional theory of superconductivity is the notion of Cooper pairing. In a Cooper pair, two electrons with opposite momentum somehow manage to overcome their ostensibly enormous repulsive energy and bind together to make a composite bosonic particle. These composite bosons are then able to carry electric current without dissipation. But what does a Cooper pair really look like? In this post I’m going to try to draw a picture of one, and in the process I hope to discuss a little bit of physical intuition behind how Cooper pairing is possible. That distance in this picture is the Thomas-Fermi screening radius, which in metals is on the same order as the Fermi wavelength (generally Angstroms). At distances much longer than , the electron-electron interaction is screened out exponentially. What this screening implies is that as long as the typical distance between electrons inside a Cooper pair is much longer than the Fermi wavelength (which it has to be, since there is really no concept of an electron that is smaller than the Fermi wavelength), the mutual Coulomb repulsion between electrons isn’t a problem. Electrons that are much further apart than simply don’t have any significant Coulomb interaction. An electron moving through a conductor will attract nearby positive charges in the lattice. This deformation of the lattice causes another electron, with opposite spin, to move into the region of higher positive charge density. The two electrons then become correlated. This kind of explanation might be accompanied by a picture like this one or even an animation like this one, which attempt to schematically depict how one electron distorts the lattice and creates a positively-charged well that another electron can fall into. But I never liked these kind of pictures. Their big flaw, to my mind, is that in metals the electrons move much too fast for it to make sense. In particular, the Fermi velocity in metals is usually on the order of m/s, while the phonon velocity is a paltry m/s. So the idea that one electron can create a little potential well for another to fall into simply doesn’t make sense dynamically. By the time the potential well was created by the slow rearrangement of ions, the first electron would be long gone, and it’s hard to see any meaningful way in which the two electrons would be “paired”. The other problem with the picture above is that it doesn’t explain why only electrons with opposite momentum can form Cooper pairs. If Cooper pairing came simply from one electron leaving behind a lattice distortion for another to couple to, then why should the pairing only work for opposite-momentum electrons? So let me advance a different picture of a Cooper pair. The probability density for the electron’s position in this state, , is uniform in space. It also has a uniform probability distribution. But if you use the two states (one with momentum and the other with momentum ) to make a superposition, you can get a state whose probability distribution looks like a standing wave: . In other words, by combining electron states with and , you can arrive at an electron state where the electron probability distribution (and therefore the electron charge density) has a static spatial pattern. In this way the system lowers its total Coulomb energy. In essence, the binding of opposite-momentum electrons is a clever way of effectively bringing the fast-moving electrons to a stop, so that the slow-moving ionic lattice can accommodate itself to it. Of course, the final piece of the picture is that the Cooper pair should have a finite size in space – the standing wave can’t actually extend on forever. This finite size is generally what we call the coherence length . 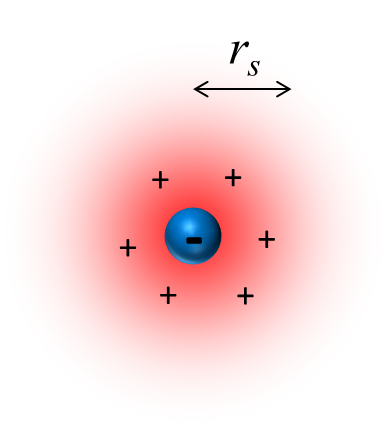 Forcing the two electrons within the Cooper pair to be confined within the coherence length costs some quantum confinement energy (i.e., an increase in the electron momentum due to the uncertainty principle), and this energy cost goes like , where is the Fermi momentum. So generally speaking the length should be large enough that where is the binding energy gained from Cooper pairing. Usually these two energy scales are on the same order, so that . I’m certainly no expert in superconductivity, but this picture makes much more sense to me than the one in Wikipedia. Your criticisms or refinements of it are certainly welcome. Author’s note: Thanks to Mike Norman, who taught me this picture over lunch one day. This entry was posted in Screening, Superconductivity and tagged BCS Theory, Cooper pairing, Superconductivity. Bookmark the permalink. Great post, I hadn’t considered this picture before. I also always had the picture in my head where an electron deforms the lattice and then another one comes by. It seems to me that you are right, however, in that this does not quite make sense. I was wondering, though, why, in your picture, the lattice wouldn’t distort to lower its energy further? Oh, the lattice does distort, so that the system can lower its energy by the positive ions putting themselves preferentially in regions of high negative charge density. That’s what I was trying to draw in the second picture. Sorry I wasn’t clear before — I was trying to ask why it doesn’t remain distorted. Why in this picture wouldn’t the lattice have a permanent, static distortion? Well, I didn’t mean to insist that the standing wave created by the electrons should be perfectly static, only that it should be essentially still on time scales of the inverse Debye frequency and shorter. But it is also true that different Cooper pairs will have different wave vectors (i.e., each pair will create its standing wave in a different direction, as determined by their position on the Fermi surface). So there is no reason that they should all work together to create a uniform distortion in the lattice. Nice post. This picture seems quite reminiscent of a Peierls instability, do you see some connection between the two phenomena? Yes, I guess that I am describing them in a similar way. The big difference, of course, is related to Anshul’s question: there is no coherent, static distortion of the lattice like there would be in a Peierls instability, since different Cooper pairs have different standing wave vectors. I’m not sure whether there is some deeper connection. This explanation and picture are brilliant! I also don’t like (hate) this picture with balls flying in the space. Reblogged this on Mientras, En Físicas. This post is brilliant, thanks a lot. I have one question if the different Cooper pairs have different standing wave vectors. How does this fit with all the Cooper pairs forming a coherent state in the superconductor? Wouldn’t they cancell all the standing waves between each other? Can we really say “cooper pairs are bososns”? I am afraid. Surely if the electron density is most likely/ greatest towards the centre of the coherence length, surely the distortion in the metal lattice would be greatest there? In your final picture, the distortion of metal lattice ions seems to be fairly uniform across the coherence length. Hi, i will like to ask you if your argument about the phonons velocity and the Fermi velocity holds at the superconductor state temperatures. I mean, if we put our system at such a low temperatur, maybe these velocities are not that different. Thanks for the post. Regards, from Colombia.